If you have any questions about the MARIA THERESA information page below please contact us. 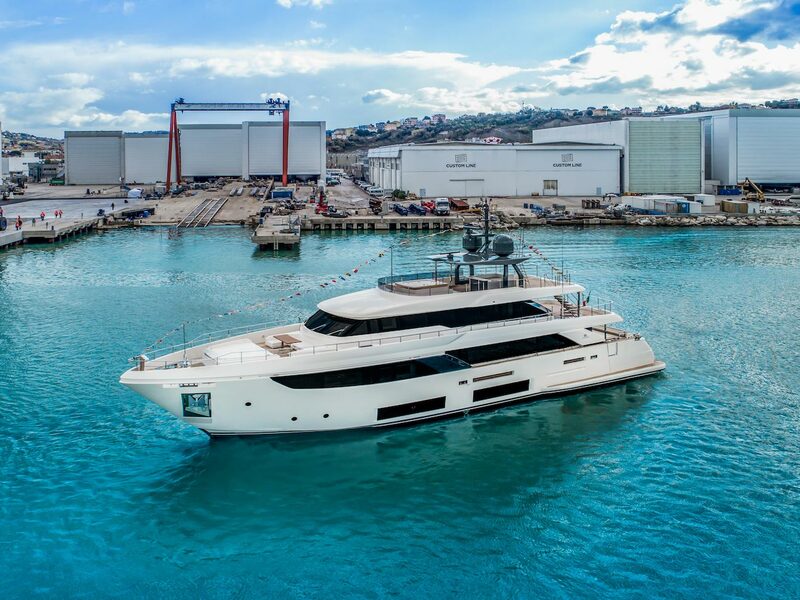 MARIA THERESA is a spacious 33m (108''3'') motor yacht built by Ferretti Group's Custom Line shipyard and is a result of a collaboration between the Product Strategy Committee headed by Engineer Piero Ferrari, the Engineering Department and Studio Zuccon International Project. She can accommodate up to ten guests in five luxury suites as well as a crew of 8 in four cabins. A generous transom door lowers to become a large swim platform for easy transfers between M/Y MARIA THERESA and tenders. 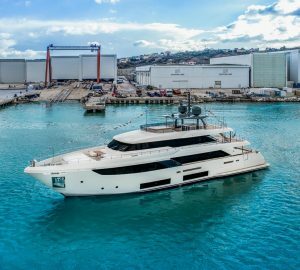 A set of stairs leads up to the main deck aft, where there is a sofa integrated into the stern along with a drinks table and chairs for casual outdoor living. The upper deck aft is the main alfresco dining area and beneath the sundeck overhang. Up to 10 guests can be seated around a grand table. The stern has an L-shaped sofa and a drinks table in each corner, and to port there is also a barbeque grill. On the bow there is a C-shaped sofa and drinks table in front of the helm station, and the bow is covered in a sunbed. The sundeck places sun loungers to the aft while under the shaded central section there is a C-shaped sofa and raised dining table where guests can unwind with a drink from the bar opposite. The sun-exposed sundeck forward has a raised Jacuzzi which can be covered to join with the surrounding sunpads. The lower deck layout places the crew cabins and mess forward with the guest accommodation placed amidships. Two double cabins with en-suite bathrooms are placed to port, while a twin cabin and a double cabin with en-suite facilities is placed to starboard. Aft of the guest accommodation is the engine room, with the tender garage in the stern. On the main deck the Master suite is placed forward and is accessed via an office with a walk-in wardrobe off the main foyer. The bedroom is furnished with a king-sized bed with a widescreen TV mounted on the wall opposite and seating beside the broad windows. The forward bathroom contains his and hers facilities along with a large shower. Amidships, the galley is placed to port of the Master suite office and a service corridor leads past the foyer to the formal dining area, placed forward in the main salon. Up to 10 guests can be seated at the elegant dining table and enjoy the views through the large windows spanning the length of the room. To the aft, guests can rest before or after a meal on the corner sofa to port, and a drinks table and armchair make an intimate setting for watching films on the widescreen TV opposite. The upper deck places the helm station forward with the Captain's cabin behind. The skylounge to the aft and has two L-shaped sofas and drinks tables to starboard, leaving the port side free for a widescreen TV or for guests to simply take in the surroundings. Glass sliding doors lead out to the alfresco dining area on the upper deck aft, and can be left open for greater connection to the outdoor ambience. The accommodation sleeps up to 10 guests across 5 spacious en-suite cabins: 1 Master suite, 3 double cabins and 1 twin cabin. The crew of 4 will ensure that everyone receives first class service throughout their time on board. We do have available further amenity, owner and price information for the 33m (108''3'') yacht MARIA THERESA, so please enquire for more information. The luxury yacht MARIA THERESA displayed on this page is merely informational and she is not necessarily available for yacht charter or for sale, nor is she represented or marketed in anyway by CharterWorld. This web page and the superyacht information contained herein is not contractual. All yacht specifications and informations are displayed in good faith but CharterWorld does not warrant or assume any legal liability or responsibility for the current accuracy, completeness, validity, or usefulness of any superyacht information and/or images displayed. All boat information is subject to change without prior notice and may not be current.